With Tesla, there's always something new coming up to keep owners, buyers, and fans excited. The company's main task over the next year is to get its lower-priced Model 3 electric car into volume assembly at high quality, a process CEO Elon Musk has called "production hell." But there's more to come, one of the new products being Tesla's promised all-electric semi tractor, apparently for long-haul freight. Now some details may have leaked out, in the form of an e-mail conversation between Tesla and the Nevada Department of Motor Vehicles seen by the Reuters news service. In those documents, Tesla sought state approval to test a prototype of its electric semi in Nevada that will contain self-driving software. California DMV officials told Reuters they were to meet Tesla yesterday to discuss the company's "efforts with autonomous trucks" as well. According to Reuters, the Tesla semi is likely to offer the capability of "platooning." That's the term for automated vehicles traveling very close together at speed, which significantly cuts aerodynamic drag. Vehicles that platoon must continually communicate with each other and the infrastructure around them, but the distances between them are far too short to allow a human driver to react in time to emergencies. Several companies are working on autonomous driving technology specifically for long-haul trucks, in Silicon Valley and elsewhere. Long-haul trucks do not face cross traffic when they travel on limited-access highways, and they largely operate at steady speeds. Those are seen as more favorable conditions for self-driving vehicles than the far more diverse circumstances faced by passenger vehicles in a wide range of uses. Platooning, meanwhile, is seen as a way to reduce fuel consumption significantly among trucks with internal combustion engines (or energy use in the all-electric Tesla semi). Daimler, Volvo, and other European heavy-truck makers have put years of effort into the technology, including numerous demonstrations on limited stretches of highway. 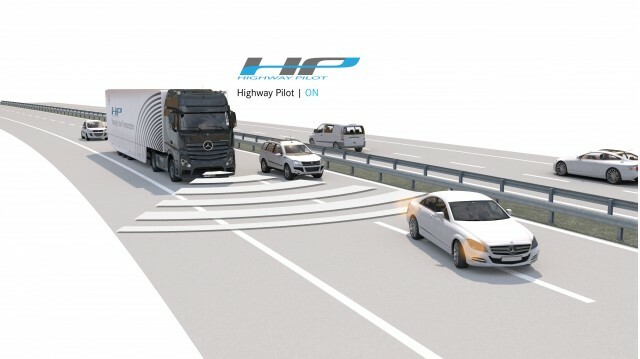 Platooning is viewed as a precursor to fully autonomous long-haul trucks, which are still widely assumed to be 10 years or more in the future. Musk released a teaser image of the Tesla semi at a TED Talk in May. He has driven the semi, he said, calling the big rig capable of sporty and spirited driving characteristics. "This will be a very spry truck," Musk said. "You can drive this around like a sports car."